Two fly-tippers were caught out by an undercover operation mounted by Liverpool City Council officers and police. George Parry, 55, and David Smith, 53, both of Aspes Road, West Derby were captured on film as they dumped tonnes of dangerous waste outside a school. The two men fly-tipped the waste, including sheets of asbestos and sacks of broken asbestos, by the Jade School for Dance gates in Back Broadway, Liverpool. In fact, the men had been spotted dumping rubbish at the same site on several occasions. They had been running a man-and-van service. 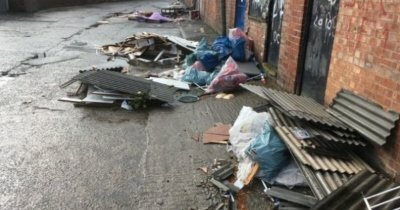 Parry and Smith had their transit van seized and destroyed by the Council and appeared before Liverpool Magistrates’ Court facing four charges of fly-tipping. The two pleaded guilty. Parry was sent down for 20 weeks and fined £580. He was also handed a 12-month driving disqualification. Smith was locked up for 12 weeks and given a £580 fine.